DALLAS (FWAA) – The Football Writers Association of America proudly announces its 75th Anniversary All-America Team, celebrating the association's All-America teams from near the end of World War II through the 2014 season. The FWAA, which was founded in 1941, has picked an annual All-America team since the 1944 season, making it the second longest continuously selected team in major college football. The FWAA's first All-America team in 1944 included Army's famous running back tandem of Doc Blanchard and Glenn Davis and Georgia Tech's Frank Broyles, who later became Arkansas' legendary head football coach. Seven decades later, the 2014 team featured Heisman Trophy-winning quarterback Marcus Mariota of Oregon, Outland Trophy winner, offensive tackle Brandon Scherff of Iowa, and Bronko Nagurski Trophy winner, linebacker Scooby Wright III of Arizona. "This was one of the most fun, yet most difficult exercises I've had in life – next to parallel parking, that is," said FWAA 75th All-America Committee chairman Kirk Bohls of the Austin American-Statesman. "Truly, it was an exciting – if not impossible – task to find the best 75 college football players ever. Please save your hate mail, but feel free to weigh in and tell us how we messed up. And I'm sure we did, but no one should argue that it wasn't a great idea to honor the best who have ever played the game. Let the debating begin." A nomination ballot with selected players from all FWAA All-America teams was sent to the entire membership this spring. The popular vote was then taken into consideration by a Blue Ribbon Committee of FWAA past presidents, current board members and officers. That committee put the finishing touches on selecting the 75-man team. In order for a player to be considered for the FWAA's 75th team, he had to be on a previous FWAA All-America team. The FWAA's 25-man first team included Navy quarterback and Heisman Trophy winner Roger Staubach, the only member from a military academy; the only two-time Heisman Trophy winner running back Archie Griffin of Ohio State; three-time FWAA All-America end Leon Hart of Notre Dame; and the only two-time Outland Trophy winner, center Dave Rimington of Nebraska. On the three 25-man teams, the Cornhuskers led all schools with six selections – including four on the first team – and four of their overall honorees are Outland Trophy winners. Ohio State and Pittsburgh each had five selections and Alabama, Oklahoma and Texas had four. Schools with three selections were Florida State, Georgia, Michigan and USC. 75th Anniversary All-Americans by school (75 players from 41 schools): Nebraska 6, Ohio State 5, Pittsburgh 5, Alabama 4, Oklahoma 4, Texas 4, Florida State 3, Georgia 3, Michigan 3, USC 3, Florida 2, Miami (Fla.) 2, Notre Dame 2, UCLA 2, Auburn 1, Baylor 1, Boston College 1, BYU 1, Colorado 1, Georgia Tech 1, Illinois 1, Iowa 1, Kentucky 1, Louisiana Tech 1, Marshall 1, Maryland 1, Michigan State 1, Mississippi Valley State 1, Navy 1, North Carolina 1, N.C. State 1, Oklahoma State 1, Penn 1, Penn State 1, SMU 1, Southern Miss 1, Tennessee 1, Texas A&M 1, Utah State 1, Virginia Tech 1, Washington 1. 75th Anniversary All-Americans by current conference: Big Ten Conference 19, Atlantic Coast Conference 15, Southeastern Conference 13, Big 12 Conference 10, Pac-12 Conference 7, Conference USA 3, Independents 3, American Athletic Conference 2, Ivy League 1, Mountain West Conference 1, Southwestern Athletic Conference 1. "Picking the FWAA's 75th Anniversary teams was like taking a final exam with no wrong answers," said 2015 FWAA President Lee Barfknecht of the Omaha World-Herald. "Even though some answers may be more 'right' than others, this will add to the colorful conversation about college football, honor those chosen, and help celebrate the game." The quarterbacks of the top two teams are both Heisman Trophy winners: Staubach and Tim Tebow of Florida. Quarterback Tommie Frazier of Nebraska was selected to the third team after leading Nebraska to back-to-back national titles and finishing runner-up in the Heisman Trophy his senior season. All six of the running backs are Heisman Trophy winners: Griffin, Georgia's Herschel Walker, Pittsburgh's Tony Dorsett, Oklahoma State's Barry Sanders, Auburn's Bo Jackson and SMU's Doak Walker. There are 16 Outland winners (selected since 1946) and five Bronko Nagurski Trophy winners (selected since 1993) on the three teams. All eight decades in which the FWAA teams have been selected are represented on the 75-man team, starting in the 1940s with SMU's Walker all the way through Alabama's two-time All-America Barrett Jones, the 2011 Outland winner. In all, there are 56 members of the National Football Foundation's College Football Hall of Fame and 41 schools are represented on the three 25-man teams. The FWAA has selected All-America Teams in different forms over the years. All the teams are online at allamericateam.com and footballwriters.com in the All-America section in the FWAA awards area. "This was truly an enriching experience picking this team," said FWAA Executive Director Steve Richardson. "It put our members in contact with the great players of the past and truly gave them a better snapshot of college football history. All of our All-Americans were great, but picking this team was like choosing between a filet mignon and a Kansas City strip." Founded in 1941, the Football Writers Association of America consists of 1,400 men and women who cover college football. The membership includes journalists, broadcasters and publicists, as well as key executives in all the areas that involve the game. The FWAA works to govern areas that include game-day operations, major awards and its annual All-America team. For more information about the FWAA and its award programs, contact Steve Richardson. The FWAA welcomes comments on the selection of its 75th Anniversary All-America Team. 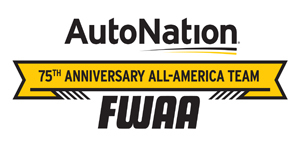 Please send your comments to allamerica@fwaa.com or Tweet them to @TheFWAA.